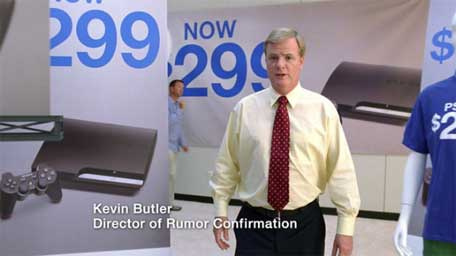 Looks Like Kevin Butler Has Indeed Put Playstation 3 Back On The Map. According to predictions from EEDAR analyst Jesse Divnich, the Playstation 3 will top the American hardware sales charts for the USA with Sony's system occupying 400,000 (blimey!) units in the period. Their data suggests that the Wii and XBOX 360 will round out the chart respectively, shifting 375k and 370k a piece. It's not a landslide victory, but it should have Sony smiling from ear to ear, simply because it could mark a turn around. While offering slightly different figures, Wedbush Morgan's Michael Pachter agrees with the outcome of the EEDAR analyst. We'll have to wait for the NPDs for the final figures, but it looks like Sony's marketing finally paid off.